India is loaded with countless tourist places and Jodhpur is one of them. 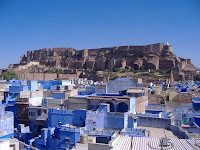 This second biggest city of Rajasthan is identified as blue city of India. 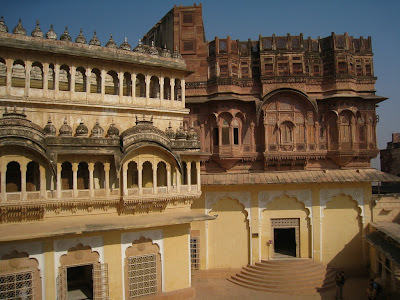 Mehrangarh Fort is the best and most demanding spot of Jodhpur. The permanent sunny weather of Jodhpur makes this destination hot and different comparing to other places of India. 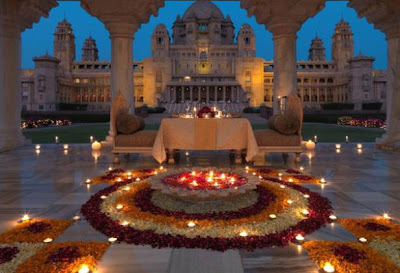 This Sun City receives light rainfall, though travellers can enjoy the Thar Desert of Rajasthan. This Indian tourist place offers multiple attraction spots having big historical value. The properly preserved forts of Jodhpur are first choice for visitors. People from around the corner are reaching Jodhpur at various occasions. The major income procedure for the city is tourism. 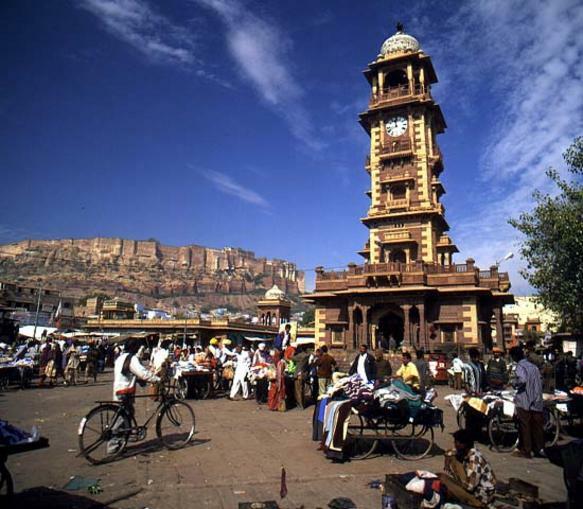 The market of Jodhpur is famous in whole Rajasthan. Jodhpur was established in the late years of 1400. Prior to 1400 period the city was ruled by Pratihara Empire. Rajput’s took the control in late 1400’s, though the complete route between Delhi and Gujarat was under Rajput control at that time. Rajput emperors developed the city with wealth and trade centres. Later they added the city as essential part of the Marwar state. Hence the person living in such region was identified as Marwaris. Everybody knows that Marwari is the best in business so most of the people are into the trade of different types and located on various parts of the country. Arrival of Mughal in the city is also the important part played vital role in development of city. Attaining to this city is easy because Jodhpur is properly linked to nearly each main city of India. Tourist can reach to Jodhpur through air, rail and road. 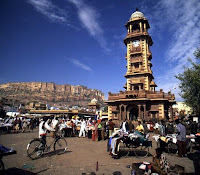 Talking about the tourist spots o. f Jodhpur there are countless locations where tourist can visit. Learning the history of city is possible by visiting forts and many historical destinations of Jodhpur. Experts suggest tourist must spend at least a week in the city to enjoy every spot. The stunning monuments, museums and forts of the city are special areas for tourism. The best and inimitable spot of Jodhpur is labyrinths lane located in the old city. Here tourist can also get the beautifully handcrafted products, though the textile of Rajasthan is also famous. Attaining to old city allow visitors to watch the big six mile extended wall with 8 different entrances. Walking around the city is definitely a good experience especially for those people who visit first time to Jodhpur. 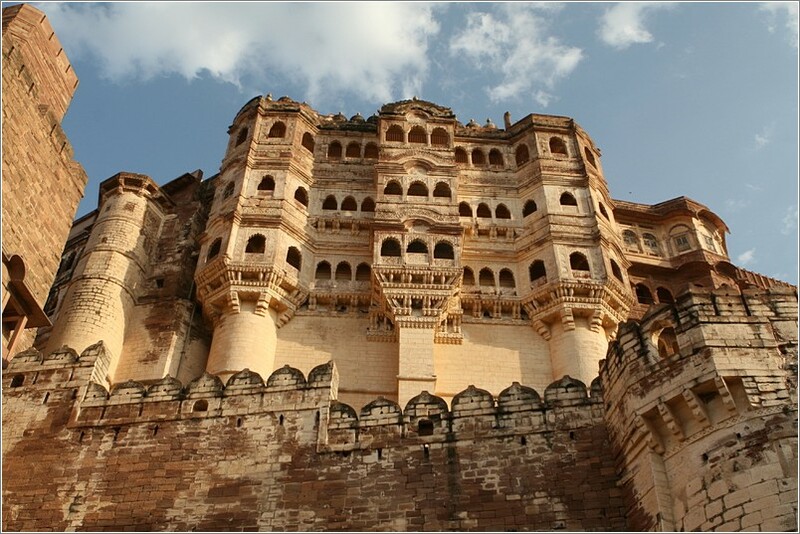 Mehrangarh Fort: Rajasthan is having a special place for monuments in India as many rulers came and created magnificent structural design for their fort, palace and other enjoyment places. 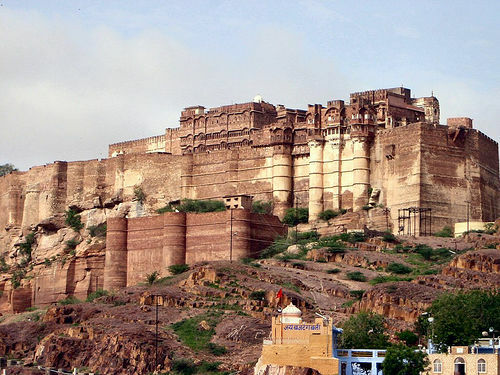 The Mehrangarh Fort of Jodhpur is one of the best forts of India located at 150 meter height from the ground. Basically this fort is constructed on the hill by Rao Jodha who was the chief of Rathore clan. This fort was completed by late 1459. 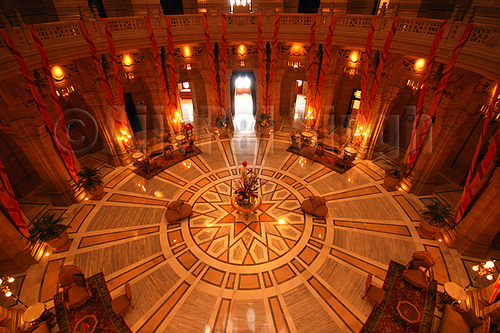 Umaid Bhavan Palace: this palace is listed in one of the fascinating palaces of India. 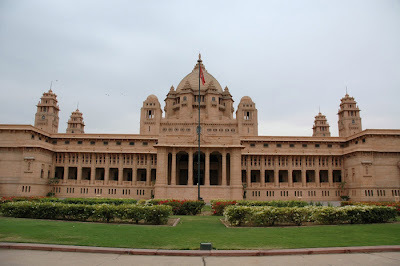 Umaid Bhavan Palace was constructed by Maharaja Umaid Singh in end of 20th century. However, maximum part of the palace is converted to museum and hotel. Jaswant Thada: the next must watch spot of Jodhpur is Jaswant Thada located on the left side of the Mehrangarh Fort. This royal monument is made of pure white marble brought from several parts of the state. Construction was done to honour the Maharaja Jaswant Singh. The Jodhpur fort is superb pieces of structural design of Rajasthan offering the eye-catching view of the city. The fort is located on the top of hill with 7 entrance gates. The basic reason for creating long and lengthy gates was to protect the fort from enemy attacks. Here tourist can watch the very well preserved walls of fort. Experts refer the Jodhpur fort as must see destination of India. The museum in fort is also special location for visitors allowing them to learn the history of city. 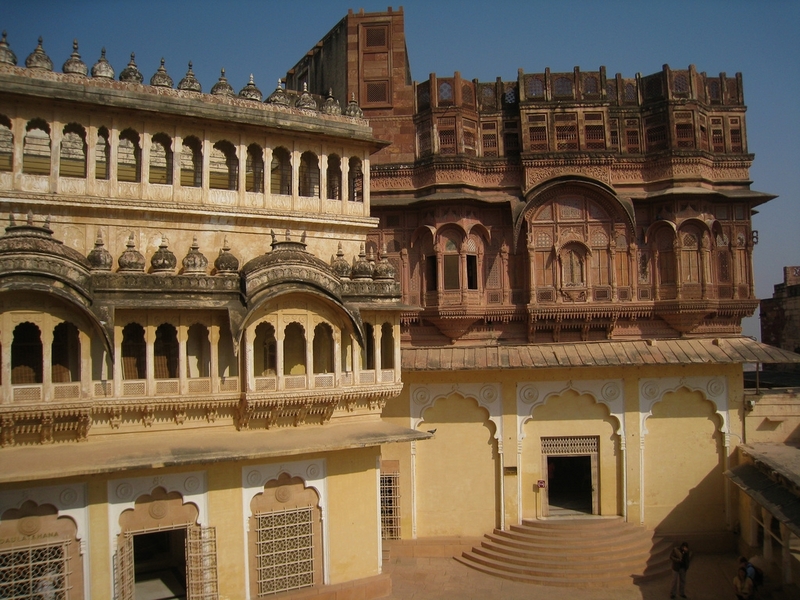 Tourist can watch the earlier costumes, artefacts and arms used in early ages of Jodhpur City. The NGM (National Geological Monument) is one more place situated within the fort. According to sources NGM is the location where the final igneous movement occurred. It was conducted nearly 4000 million ages back which is itself a record of Jodhpur City. 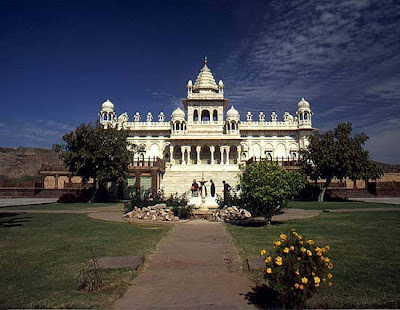 Few more attractions located inside the Jodhpur fort are palace of pearls known as Moti mahal, Palace of mirrors recognized as Sheesh mahal, and Palace of flowers known as Phool Mahal. Hundreds of visitors are reaching Jodhpur for enjoying the palaces as their design and architectural structure is amazing then other monuments of India. By Air: Reaching Jodhpur is easy as several flights from various cities of India are available for Jodhpur. Direct flights from Delhi, Agra, Mumbai, Jaipur and the Udaipur City are accessible. Tourist can refer to Indian Airways, Jet Airways and Kingfisher Airlines for taking the flight of their choice. However, the airport of Jodhpur is only 3 miles away from the centre part of the city. Local taxies and buses are available for tourist attractions which is best part for unknown or foreign tourist. By Rail: The big railway network of India allow tourist to reach Jodhpur through train as well. Properly linked railway station of Jodhpur is having direct trains from Ahmedabad, Delhi, Bangalore, Chennai, Kolkata, and Hyderabad. Tourist might get the link train from several other parts of the city so attaining to Jodhpur is convenient through several ways. By Road: People want to enjoy the journey through road can also hire the taxi and follow the highway route from Delhi, Jaipur, Mumbai, Udaipur and Jaisalmer. Road direction from other cities is also available at several SEO sites that traveller can refer. market. Joe is a very time-consuming process. Their are various companies which are successful and compete on price and the quality is always high. their goals and ideas coming to a mutual compromise. I found it of value to read your ideas about this issue. Please continue the good work. I found it interesting to read your ideas about this subject. biker e-commerce website, I found it interesting to read your ideas about this issue. waterproof motorcycle pants e-commerce store, I found it helpful to read your opinios about this issue. e-commerce site, I found it interesting to read your ideas about this issue. in to writing this informative article. Thank you for the article. Being the owner of an online motorcycle ecom site, I found it of value to read your opinios about this subject. this subject. Please keep up the great work. Good to see this helpful information here, Thanks for sharing..
Rajasthan is a place that is known for incredible rulers whose encounters of happiness and fearlessness are untold. It also known by many other names which complete its beauty just like the Sun City as it enjoys brightness and sunny weather around the year. It is also called as the Blue City because of the blue-painted houses that abound.